Welcome to a place with enough around-the-clock activities to keep you playing all day on the shore of the largest alpine lake in North America. It's clear water surrounded by the majestic Sierra Nevada. Jaw-dropping vistas, stately groves of pines, and gorgeous sunsets await. When it comes to wild life, we've got both kinds. 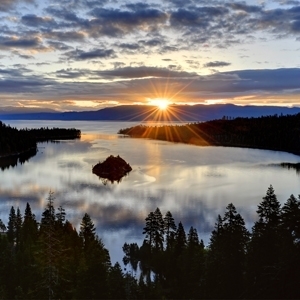 If you can think of it, you can do it at Lake Tahoe! BlueGo Public Bus service, Uber, Lyft and taxi cabs. Jan 18.0 F° 30.5 F° 43.0 F° 2.7 "
Feb 19.8 F° 31.9 F° 44.0 F° 2.7 "
Mar 24.0 F° 36.4 F° 48.8 F° 2.8 "
Apr 27.8 F° 40.8 F° 53.8 F° 1.0 "
Jun 38.5 F° 55.1 F° 71.8 F° 0.6 "
Jul 43.0 F° 61.6 F° 80.3 F° 0.4 "
Aug 42.5 F° 61.0 F° 79.5 F° 0.4 "
Sep 37.5 F° 55.5 F° 73.5 F° 0.7 "
Oct 30.3 F° 46.5 F° 62.8 F° 1.7 "
Nov 24.0 F° 37.3 F° 50.5 F° 2.9 "
Dec 19.0 F° 30.9 F° 42.8 F° 2.9 "